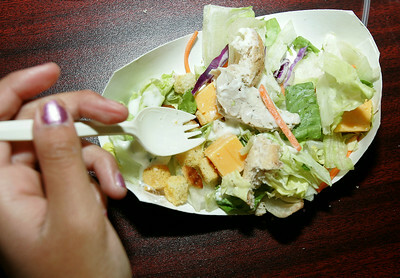 H. Rick Bamman - hbamman@shawmedia.com One of the meals provided by the First United Methodist Church's backpack program, included a salad with chicken and cheese. Church volunteers are working with the Garden Quarter Neighborhood Resource Center and the Northern Illinois Food Bank to feed 12 to 15 children three times a week. H. Rick Bamman - hbamman@shawmedia.com First United Methodist Church's backpack program, volunteers Trish Eisermann (left) and Lynn Olson prepare lunches for distibution on Wednesday, July 2, 2014 at the Garden Quarter Neighborhood Resource Center in McHenry. Eisermann and Olsen workwith the Garden Quarter Neighborhood Resource Center and the Northern Illinois Food Bank to feed 12 to 15 children three times a week.